Tom Yu's tinkerings with electronics, optics, lasers, etc. Twistyplexing is a new topology that I discovered that improves upon the charlieplexing method of LED multiplexing. It makes it easier to map LED coordinates to pairs of microcontroller pins using modular arithmetic. It also eases construction and debugging. Various authors have written about charlieplexing as a way to drive a large number of LEDs using a small number of microcontroller pins. 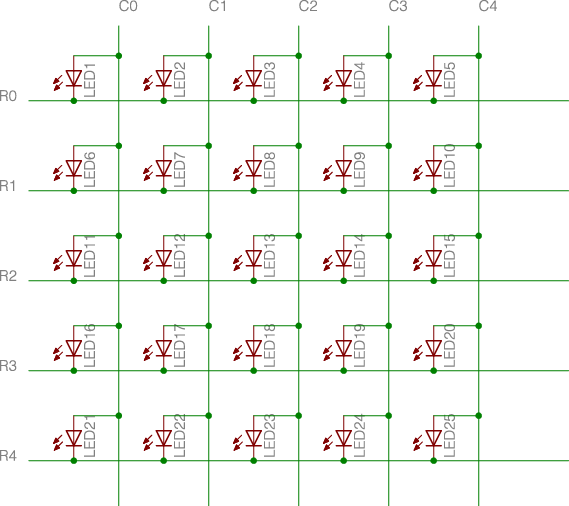 A typical presentation for a charlieplexed rectangular matrix starts with an ordinary row-column multiplexed matrix and replaces each LED on the major diagonal with a short circuit. To restore the matrix to a rectangular form, this approach shifts the upper triangle left by one column. There is a gap in the pin number sequence for the LEDs in each row. That makes it somewhat more difficult to use modular arithmetic to determine what pair of pins to use to light up a given LED. Most authors of charlieplex software resort to using lookup tables to map LED coordinates to pin numbers. The common cathode wires are still rows, but the common anode wires are now diagonals. The anode pin number for an LED is now simply anode = (row + column + 1) % N. That’s two additions and one remainder operation. (The remainder operation obviously becomes an even cheaper bitmask operation if N is a power of 2.) There’s no need to spend precious microcontroller memory on tables of pin pairs. Constructing a twistyplexed matrix is easier than constructing a charlieplexed matrix, because each common anode wire is a diagonal wire, instead of a vertical wire with a sideways jog in the middle. Debugging is easier, because all LEDs that share a common anode wire lie in a straight line (possibly wrapped around toroidally). To be fair, there is a way to use modular arithmetic to map LED coordinates to pin numbers with the traditional charlieplexed matrix, but it requires more operations and is somewhat trickier to implement. 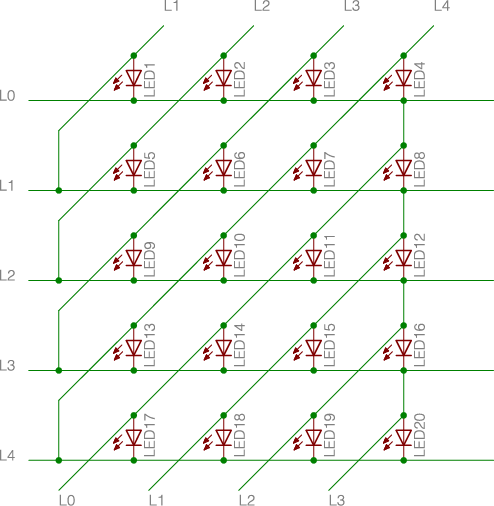 A slightly different topology by McLaren in the comments to this Instructable still tries to maintain the ordinary row-column matrix structure, while inserting a single diagonal “floating row”, which would still lead to complications in pin mapping. Hi Tom. Very interesting article and method. Thank you. I don’t think the pin mapping for my “floating row” topology is any more complicated than the pin mapping for your “twistyplexing” topology, and may actually be less complicated. 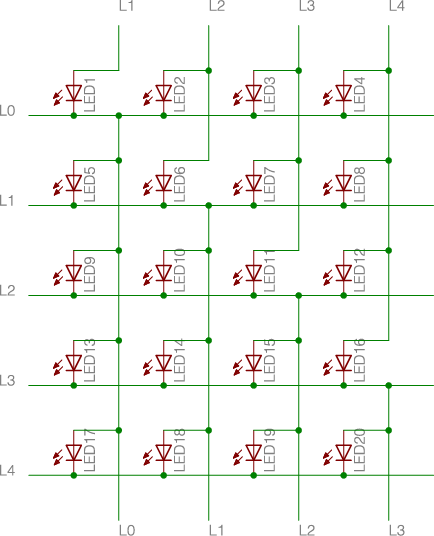 For example, when wiring up Charlieplexed 7-segment displays. Also, I suspect ‘twistyplexing’ may actually have more computational overhead than the “floating row” method. Unless I’m mistaken, to turn any individual LED on or off, you’d need to calculate “row = led_number / 4”, “column = led_number % 4”, and then “anode_pin = (row + column + 1) % 5”. 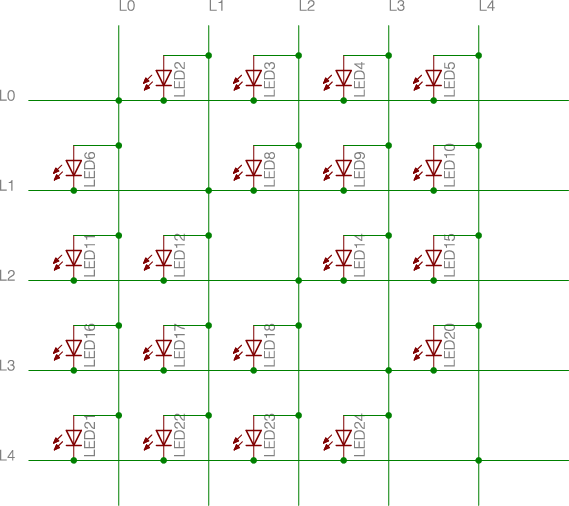 By comparison, the “floating row” method maps row and column directly to I/O pins and requires “row = led_number / 4”, “column = led_number % 4”, and a simple comparison to select the floating row pin; “if(column == row) row = 4” (where ‘4’ is the float pin).